The outermost canal of the centre of Amsterdam is the Singel, and south of that much of whats good about the centre continues. Zuid has the Museumplein, which has festivals and exhibitions on a regular basis and of course the museums. It has the busy Ferdinand Bolstraat and the expensive P.C Hooftstraat, and the Vondelpark, where on days with good weather you can find as many as 10,000 Amsterdammers and tourists alike hanging out and pretending theres peace and quiet. 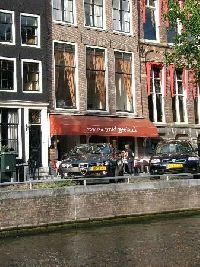 Theres shopping in the daily Albert Cuyp market, nice restaurants, culture and beautiful buildings. These are generally high-priced and populated mainly by students and high-earning, high-educated Dutch, but crime levels (mainly pick-pocketing and stealing from cars) are relatively high and directed mainly at tourists. Residents and visitors alike are advised to leave nothing in their cars and to let this show: keep the glove compartment open. Here social housing apartments (completely acceptable places to live in the Netherlands) cost 100 more than a similar one in the west of Amsterdam (Geuzenveld, Bos en Lommer), and could end up more than 1,600 for an apartment.